Add natural beauty to your home with the Shrewsbury Window Box. Each window box is a hand crafted piece that any homeowner will be proud to display, and is mounted on brackets, either your own or you could purchase mounting brackets from ourselves that are designed to complement our window boxes. The Shrewsbury window boxes are constructed from Scandinavian red pine and finished with a selection of coloured preservatives or in Farrow and Ball exterior paints of your choice.. It is quite possible to have window boxes for spring, summer or winter colour. For a summer window box, begin by planting a central "bushy" plant - geraniums or fuchsias are ideal. Then surround them with several smaller potted plants such as petunias , and include plants such as French marigolds, alyssum and patience plants around the centre area .You can then add trailing varieties of lobelia, geranium and ground ivy at the edges. 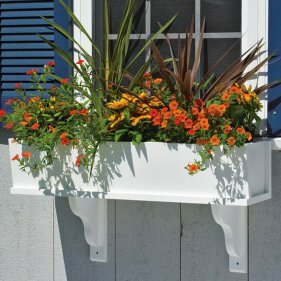 The tomato variety Basket King fits a window box, and they are ideal quarters for herbs. Again, as with other garden planters, choose the low-growing ones such as sage, parsley and thyme. you should not put a few spring bulbs into a winter window box, or even plant up an early spring window box with bulbs such as crocus and low-growing varieties of some of the tulip species. In the very coldest of regions, where winters are even too severe to grow broad leaf evergreens at all, rely on cut branches of conifers. Spring and summer window boxes will need feeding once a week with a liquid seaweed or liquid tomato fertilizer. Plants in winter window boxes will hardly be growing at all, so will need no feeding. 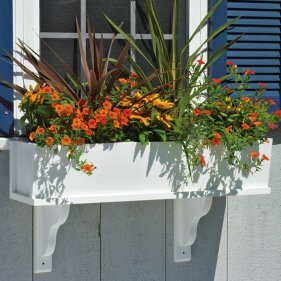 Spring and summer window boxes need to be watered regularly. In summer they should be watered at least daily and, if they are in a particularly warm, sunny position, they may need watering twice a day. usually dry, keep an eye on the soil mix; water only when the top feels dry.